The Āḻvār, Śrī Thondar-adi-podi (dust of the feet of the devotees of the Lord), in these verses requests the Lord of Śrīraṅgam to awake from his Yoga Nidrā to bless all those gathered to receive his Darśan. O’ Śrī Raṅganātha be pleased to arise and bless us all! (Arangathama Palliyezhundarulaye). This hymn is to be sung every day by devout Śrī Vaiṣṇavites as part of their daily prayer. 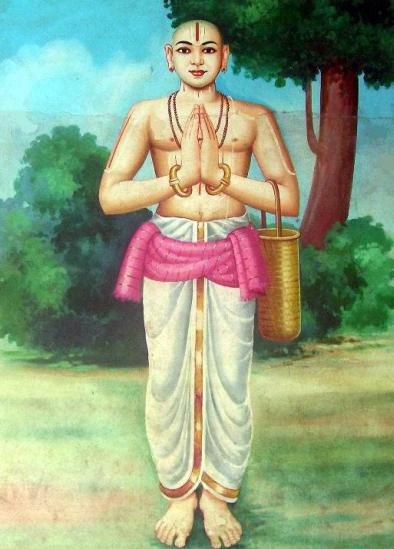 (Nithyanusandhanam). The sun has risen in the east reaching the mountain peak. Dense darkness has departed. Day has dawned. Nectar starts dripping from flowers just blossomed. Celestials and kings have started assembling in front of the temple gate. all around beats the noise made by the breakers of the billowing sea. O! Lord of Śrīraṅgam! Be pleased to arise and bless us all. lifting the fetching fragrance of the bountiful jasmine flower creepers? are shaking off the dew drops from their wide wet wings. by the fearsome white teeth of the awful jaws of the crocodile! "O! Raṅganātha! Be pleased to arise and bless us all!" The glittering stars have ceased to twinkle. The moon which spread cool brightness around has faded. lifting the pall of enveloping darkness. rustling through their boughs and fresh shoots. Be pleased to arise and bless us all! combined to make a musical ensemble moving across the fields. the bow which tormented the tribe of Lankan Rākṣasas the mighty king of Ayodhyā! Be pleased to arise to bless us all! it is day break. Darkness has receded, dawn advancing. which mingles with the roar of great eastern sea. to offer worship at the Lord's feet. Who are the celestials that have arrived? There are eleven bull riding Rudras. Is it not that there are the eight Vāsus? This must be the twelve Ādityas yonder! with their bejewelled chariots. Kumara with his divisions, six faced riding the peacock. like tidal waters breaking on the cliff. O! Lord Be pleased to arise and bless us all! Who are all others in the gathering of the celestials? The sages of rare penances and Maruts. Surely this must be Indra come with his Airāvata, his white elephant. are swaying to entrancing music. eager to worship your holy feet! O! Lord! Be pleased to arise and bless us all! The virtuous sages Tumburu and Nārada singing your praises. driving away darkness from the firmament. O! Lord, Be pleased to arise and bless us all! the single stringed lute, the flute, the kettledrum and so on. sending everybody including siddhas into a trance. O! Lord of Śrīraṅgam! surrounded by Cauvery! calling himself the dust of the feet of your devotees! Be pleased to arise and bless me as an indulgent father his son!